Darien Dr. Denis Bouboulis has ganed national recognition as an expert on a rare pediatric disease. Darien Dr. Denis Bouboulis has been making the rounds lately, both in his white coat, treating patients at his Darien office, and on television, informing the nation about an under-diagnosed disease that he specializes in. Last week, Bouboulis was seen on the Today Show; he also taped an episode of Inside Edition, which will air this week as well as a spot on MSNBC; he's also agreed to appear in an upcoming episode of Dateline, the doctor said. 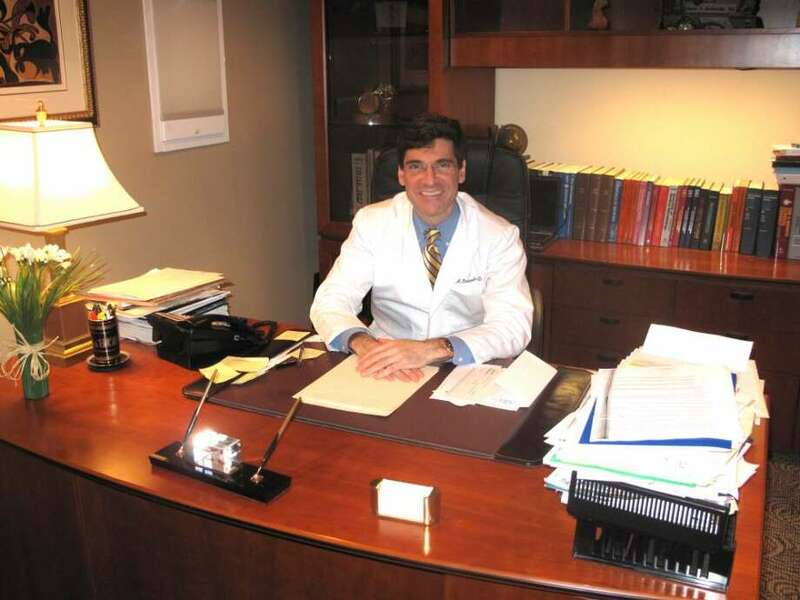 Bouboulis is a board certified physician and an immunologist who runs his own practice, Advanced Allergy Immunology & Asthma, PC, at 106 Noroton Avenue in Darien. He's been based in Darien since 1993, but has recently become nationally recognized as an expert treating PANDAS (Pediatric Autoimmune Neuropsychiatric Disease Associated with Streptococcus). "Basically what that means is that the immune system responds in an appropriate fashion to an initial strep infection -- usually Group-A strep, a type of strep that most often causes respiratory infections -- and when the immune system responds to fight against the strep, it creates antibodies," Bouboulis said in his office on Tuesday. "There's what we call molecular mimicry. The toxins in the strep resemble some of the constituents of the nerve cells in the brain," he said. After the streptococcus is defeated, the antibodies continue to attack the nerve cells, causing a shift in dopamine within the brain. This change in dopamine levels can cause many disruptions in the body, including ticks, anger rages, obsessive compulsive behaviors and severe separation anxiety, Bouboulis said. He recently treated a 12-year-old girl whose PANDAS manifested itself in a severe sneezing problem, causing her to sneeze up to a dozen times a minute and 12,000 times a day, he said. The child and her mother were featured on NBC's Today Show last year, discussing their quest to identify the cause for the sudden onset of sneezing; they visited several doctors all around the country, and could not find an answer. She was featured on several talk shows and news programs around the country, drawing national attention to her predicament. After some misdiagnoses, the family flew up to Darien from Virginia to see Dr. Bouboulis, who diagnosed the tween with PANDAS, and began treating her. She has since stopped sneezing for the first time in months. "This is a fascinating disease. We are at the infancy of understanding this disease. It has gained international interest, because Lauren's case sparked an international awareness of this disease, once it was realized that her sneezing was not just sneezing, it was part of a larger syndrome," Bouboulis said. The girl was lucky, Bouboulis said. While sneezing every five seconds is incredibly inconvenient, it was a "mild" manifestation of the disease, which can often cause larger ticks, that make normal life near impossible. "The fact that parents who have children with PANDAS have been traumatized. You have a child that's doing well, and all of a sudden you literally lose your child. You wake up one morning and your child is not there. It's not the child you've known -- from a behavioral, psychological and emotional standpoint," he said. Bouboulis is one of about a half-dozen doctors in the country who treats the condition, and sees patients from as far away as Seattle, Michigan and Tennessee who are seeking treatment for the disease. He began his work with PANDAS about two years ago when he was contacted by Yale University. "They needed an immunologist who treats with IVIG [intravenous immune globulin]," he said. This treatment involves hooking the patient up to an IV for two days, and infusing new antibodies into the body to "clean up the bad autoimmune antibodies that are causing the disease," he said. "There aren't a lot of doctors in the country that are familiar with PANDAS and are actually experienced to treat PANDAS. The most definitive therapy is the use of IVIG. And there are few doctors in the county that actually use IVIG," Bouboulis said. It was the IVIG that caused his 12-year-old patient to stop sneezing, he said. But though his patient has stopped sneezing, she is not actually cured, he said. The disease affects those with a genetic predisposition -- the gene for which has not yet been identified -- and could return in the future if set off by another strep infection, the doctor said. Because there has not been a lot of research about the disease, and there are few people working in the PANDAS field, there are still many unknowns when treating the disease: one of which is whether there will be a cure for it, and what that cure may be, Bouboulis said. He's working to raise awareness of the disease through the foundation, PANDAS Resource Network (www.pandasresourcenetwork.org), and is also planning to open an infusion center to administer IVIG in his building on Noroton Avenue. Between these new plans, his television appearances and increasing awareness of PANDAS resulting in new patients, Bouboulis is very busy these days. "But I love what I do," he said. "I love knowing I can make a difference in these people's lives."